Well, my friend! It’s officially official! I’m married to a retiree! That doesn’t make me old, though. Héctor maybe. But me? Hell-to-the-nah. Even though, I had to take the entire week that followed off because I was spent- that still doesn’t make me old. 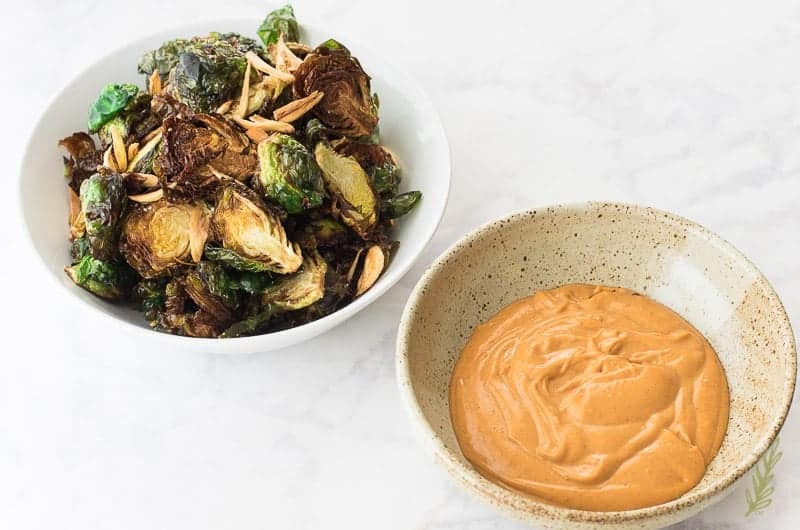 These Fried Brussels Sprouts with Gochujang-Mayo Dip did get a few pics, but besides this I was (and needed to be) a vegetable. Planning and pulling off one of the most perfect parties in history took a lot out of me, but it was soooooo worth it. I have a bit of an issue when it comes to “letting go”. More often than not, if I think I can do something for less, I will. Normal people pay other people to do the things. I have never been accused of normal, however. The party favors, for instance. 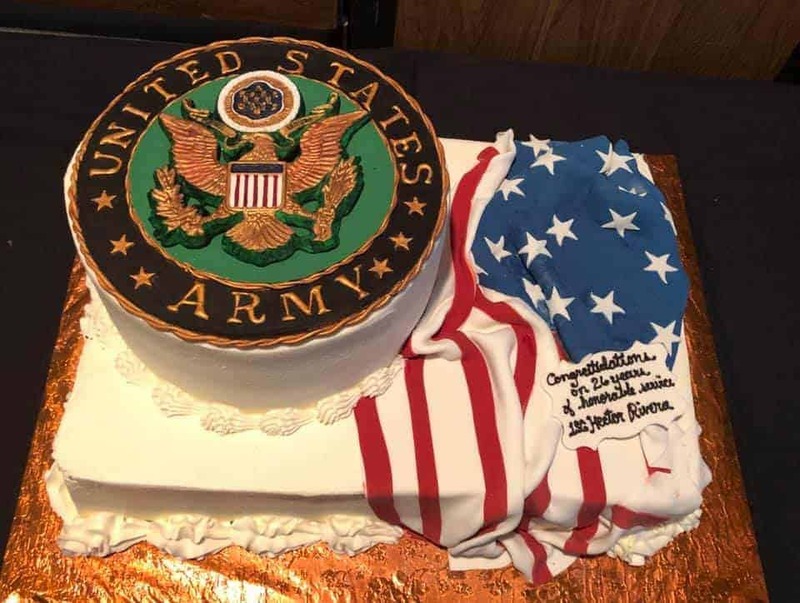 It’s always tough to decide what type of party favors to give at a military retirement. I ended up designing these ID tags with the party details and a nice message to hand out to our guests. To coordinate with the color scheme, we packaged them in black jewelry boxes, which we tied with an elastic gold bow. It was a unique, affordable way for our friends to remember our celebration. 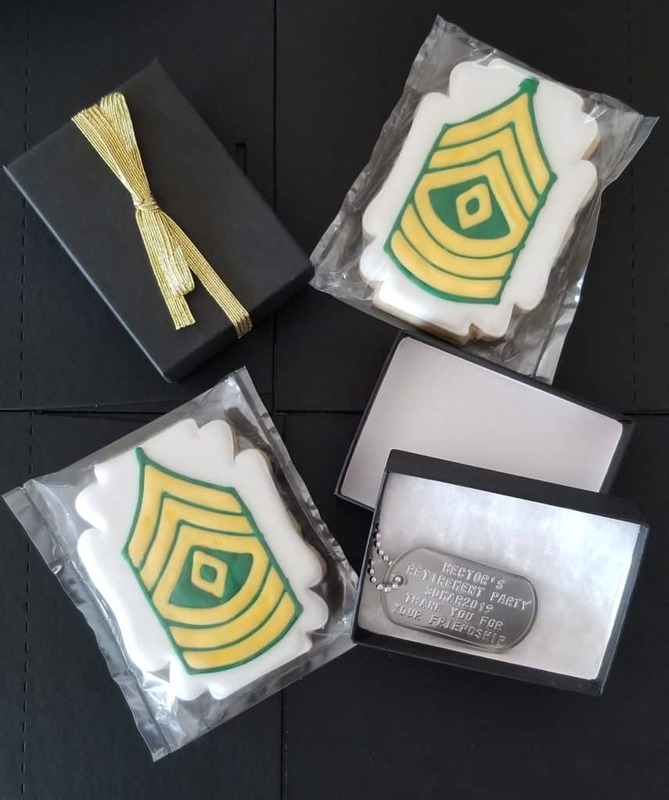 A dear friend, Morgan, baked and decorated one hundred sugar cookies with Héctor’s rank to hand out with the favors. All in all, our guests walked away with thoughtful- and delicious- parting gifts. I actually entertained hiring someone to make Héctor’s retirement cake. That lasted all of five minutes. 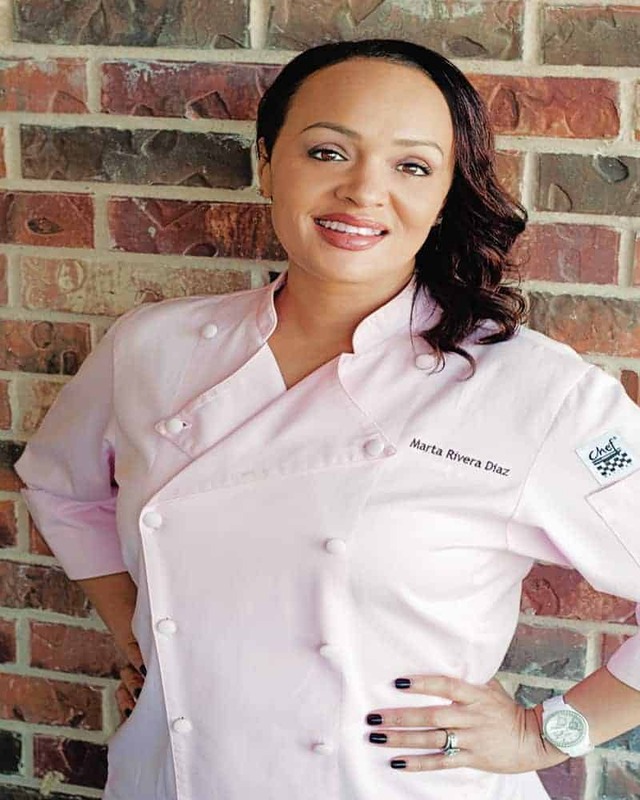 When you’re a pastry chef who used to run your own cake decorating business, it’s hard to pay someone else to do such a thing. So, I began making the topper back in February. I made sure to give myself enough time to paint it and let it dry. A couple of days before the party, I baked the amaretto and chocolate cakes. The day before we were to drive down, I decorated it with a Satin Ice fondant flag. We held our breath the entire two and a half hour drive to San Antonio. When we dropped it off at our friend’s, John and Kris, house it was perfect! I could finally breathe again. We drove to the hotel to check in and get dressed for our meet-and-greet. I planned a weekend of catching up and partying in San Antonio. We had people coming from all over the country- and even a few from Australia- so, I wanted us to spend as much time together as possible. 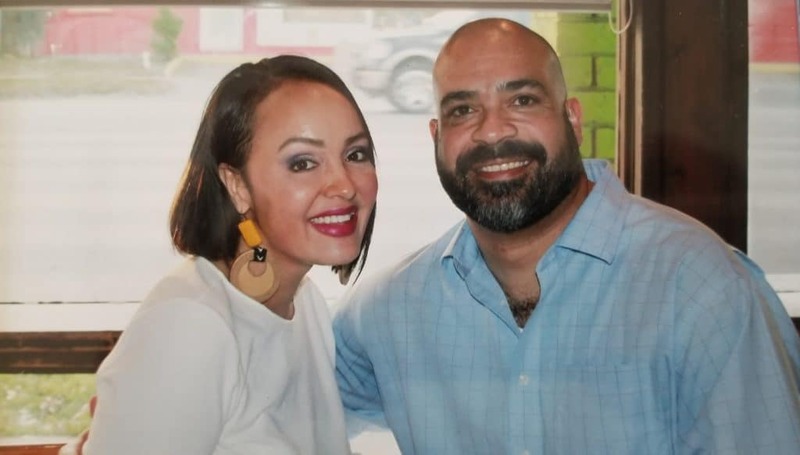 The first event we enjoyed was a dinner held at Tomatillo’s in San Antonio. It’s a great Tex-Mex Cantina downtown. We arrived in time to catch some of the happy hour specials (WINNING) and dinner was delicious. The staff even snapped candid photos of our dinner party that we were able to purchase as souvenirs. The following day (party day), Héctor and I ran some last minute errands to pick up flowers for our centerpieces, which we later arranged with the help of our amazing friends. Again, paying upwards of $700 for eleven centerpieces that I knew I could create with the help of my buddies was not something I could bring myself to do. With the help of Kris, Marie, Deja, John, Renondo, and Héctor, we got it done in an hour and half, and at a quarter of the price. All I needed to do was race back to the hotel and get dressed. It took me 45 minutes! Record time! 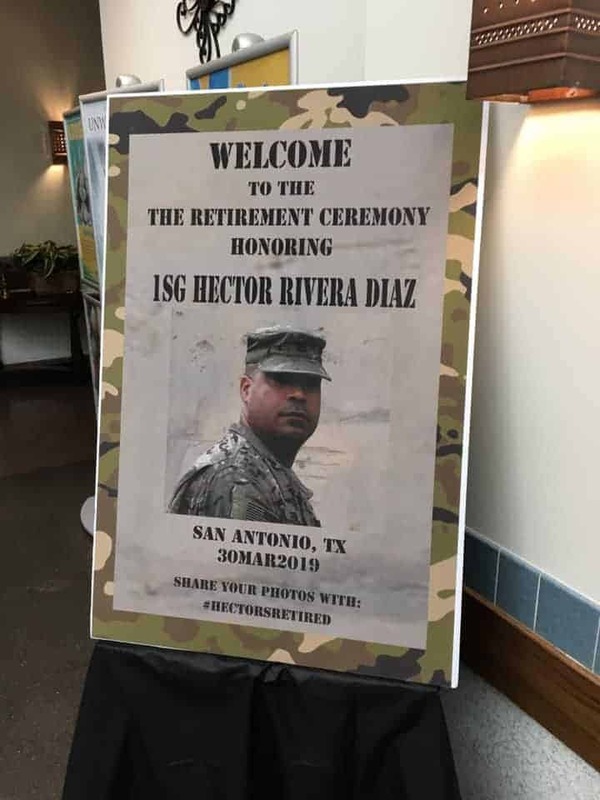 I hosted Hector’s retirement party at the Kendrick Enlisted Club on Randolph Air Force Base in San Antonio, Texas. From start to finish, the staff at the club were exceptionally helpful and they were the consummate professionals. I highly recommend them if you’re in the area. The gold backdrop for our photobooth? I purchased a bunch of fabric and sewed it myself! I added some black curtains to complete the look and made and purchased some props. The lights and stands came from my studio equipment, so a $500 DIY photobooth only cost us less than $100! All that was left to do was party! And party we did. It was the most PERFECT night ever. 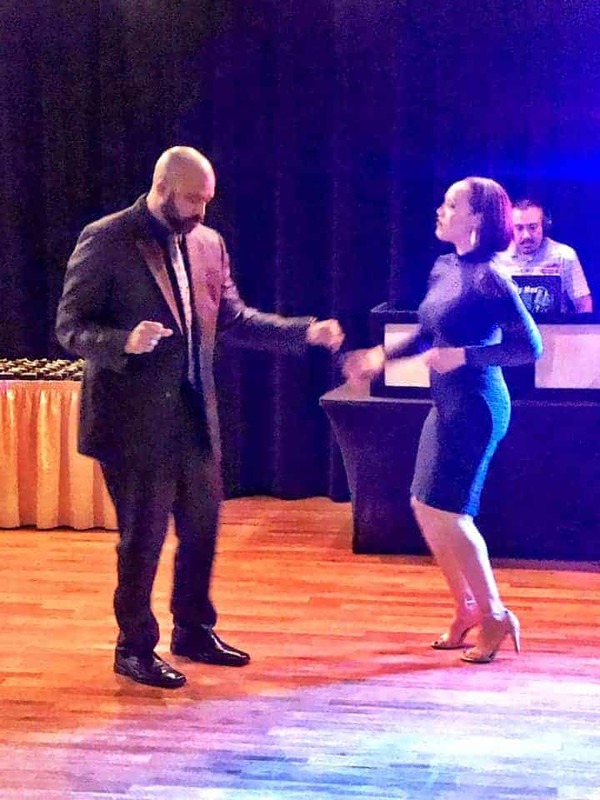 Full of laughs, hugs…and lots of dancing. But! I was sooooo exhausted when it was over!! Seriously. I knew I would need a lot of time to recover. I spent the week in bed. But, I ended up craving something savory mid-week. I wanted something quick, but I also needed something that would satisfy my salty craving. 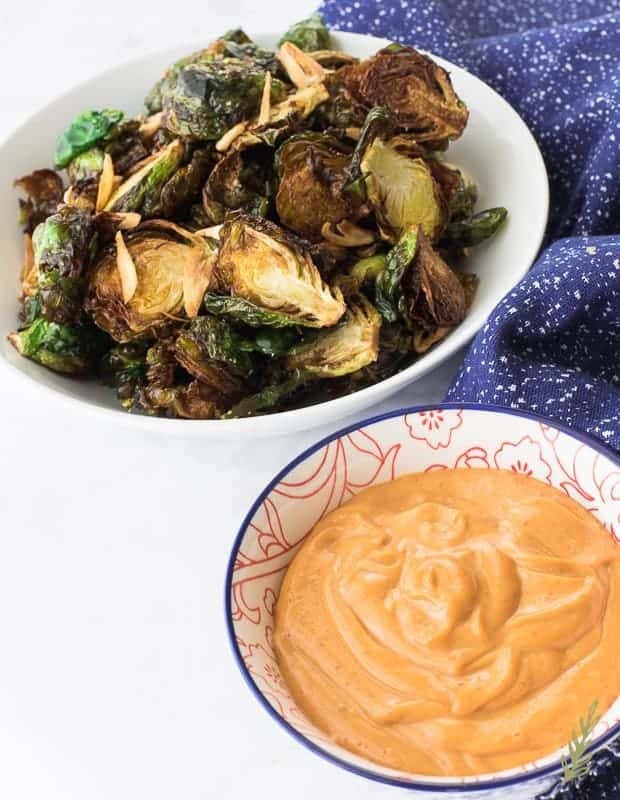 We had a pound of Brussels that I needed to use up and, after spotting a jar of gochujang and mayo, I knew what I was going to make. Now, if you’re not familiar with what gochujang is, let me explain. This Korean hot pepper paste is made from a fermented blend of chili powder and rice. It’s spicy and addictive and similar to sriracha. If you’ve ever eaten kimchi or Korean hot chicken, you’ve tasted it. For me, it’s the perfect balance of sweet heat, for others, though, it may be a bit on the spicy side. Blended with mayo, you have a dip (or spread) that compliments with a wide variety of dishes. 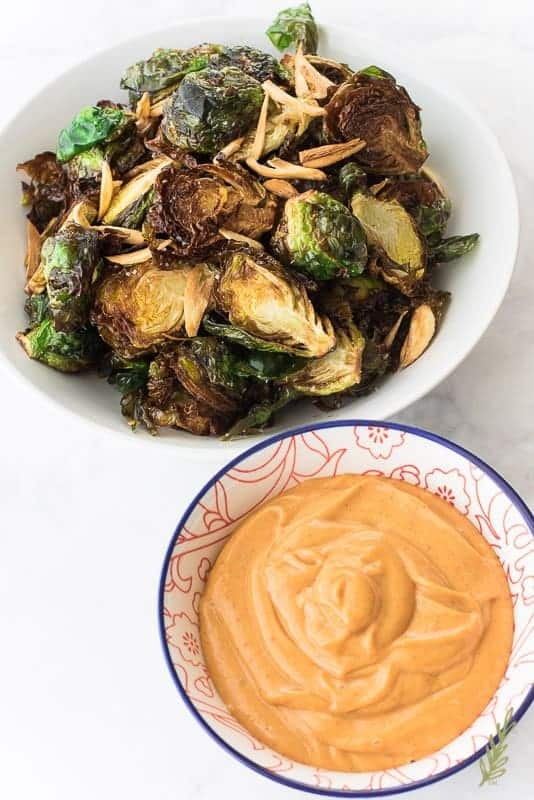 Fried Brussels sprouts rank high on the top ten list of “Best Foods to Dip in GochuJang Mayo”. It’s a legit list- really, it is. The highlight of these fried brussels is the garlic oil its fried in. The gochujang-mayo dip is crazy-easy to make. Grab a mixing bowl and your whisk and stir the two together until smooth. Place the bowl into the fridge while you prep and fry your Brussels. Since it’s very important to wash and dry the Brussels prior to frying them, I usually to do so a day before I make this dish. 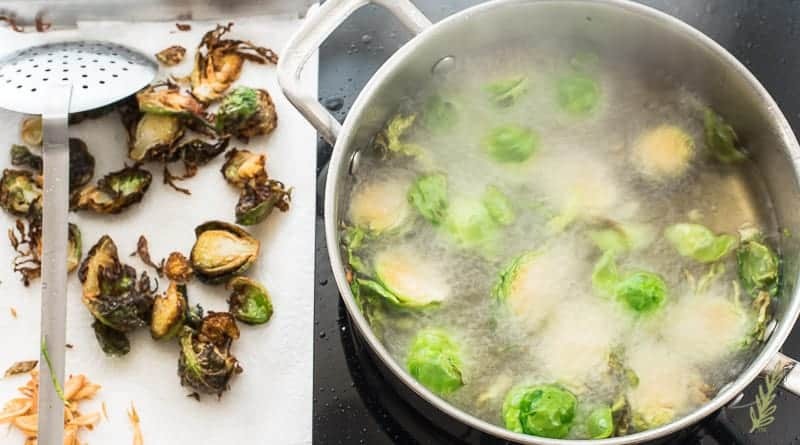 If you decide you want to fry them at the last minute, be sure to properly dry your Brussels after washing them. I’m sure you know water and hot oil don’t mix. 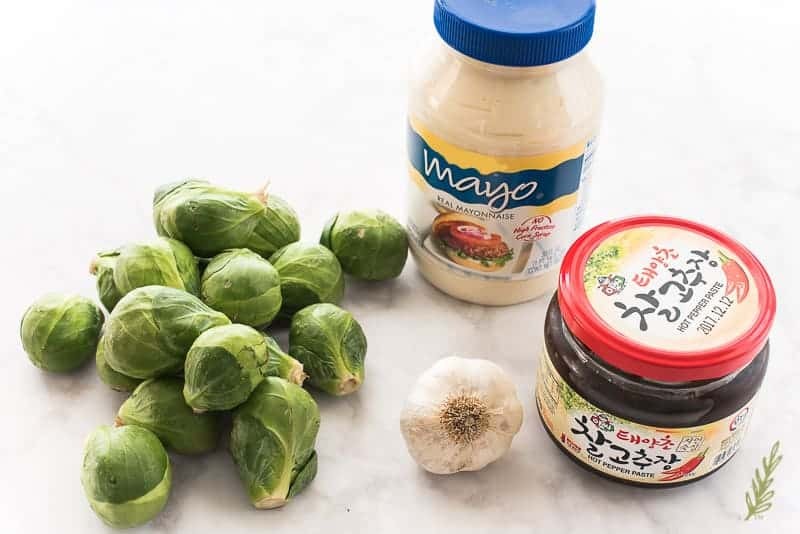 Because we’re going to dip these fried Brussels sprouts into our gochujang-mayo, you need to keep the root intact. The root holds the leaves together. You need to trim off the very end of the root, however, because it’s tough and dried out. 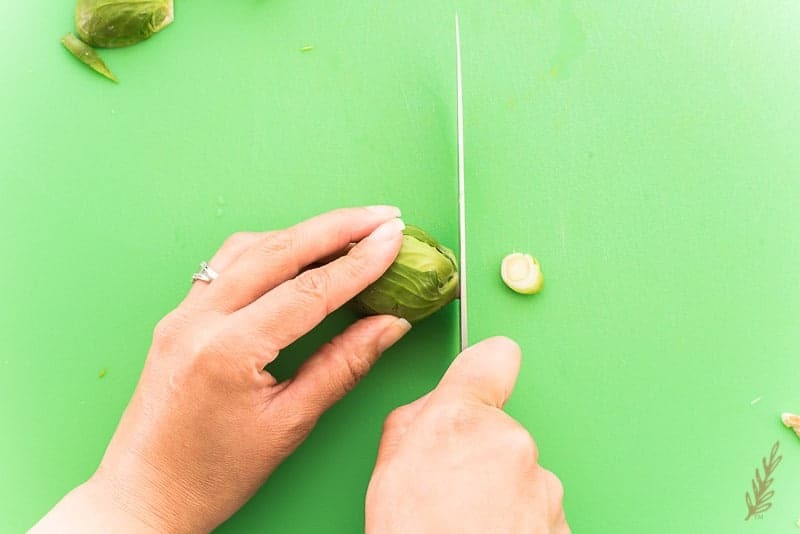 Use a chef’s knife to shave off a small sliver of the root. Peel off any brown, wilted, or otherwise damaged, outer leaves. Discard the trimmings. 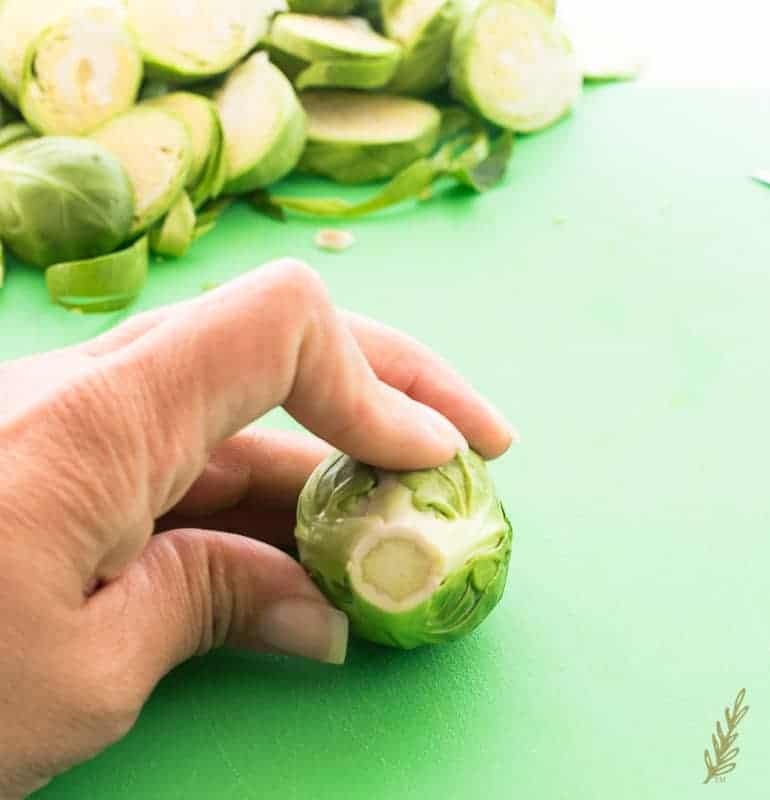 Once you’ve trimmed the sprouts, visualize the center of the sprout. You want a good quantity of “meat” on either side of where you make your cut. Send your blade through that line you’ve imagined. Halve all of the Brussels this way. You’re going to flavor your oil with slivers of fresh garlic. To do so, peel four cloves. Choose garlic cloves that are plump and firm. Once you’ve peeled them, trim the woody root end, then thinly slice them. Fill a skillet halfway with vegetable oil, then add the garlic to the oil. It’s important to add the garlic to the oil while it’s still cold so you can infuse the oil with the garlic’s flavor without burning the garlic. Bring the oil up to 350°F. Use a thermometer to make sure your oil’s temperature is correct. Since the garlic will brown before the oil is at the correct temperature, you need to watch it carefully. 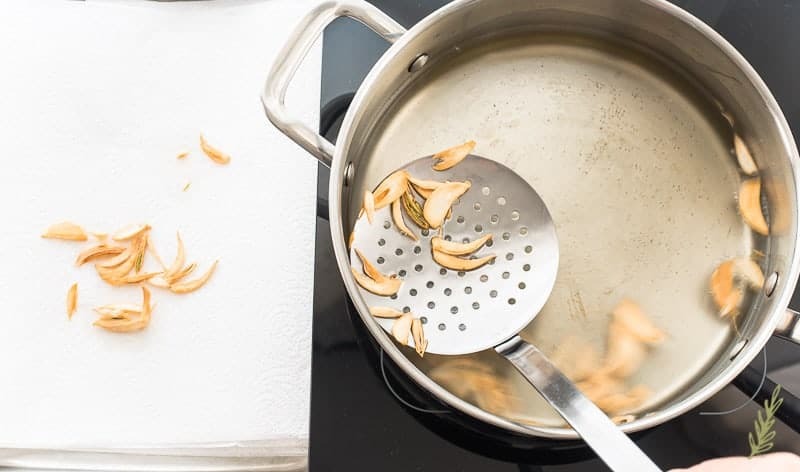 Once the garlic chips begin to take on a golden color, use a spider (or a slotted spoon) to remove them from the oil. 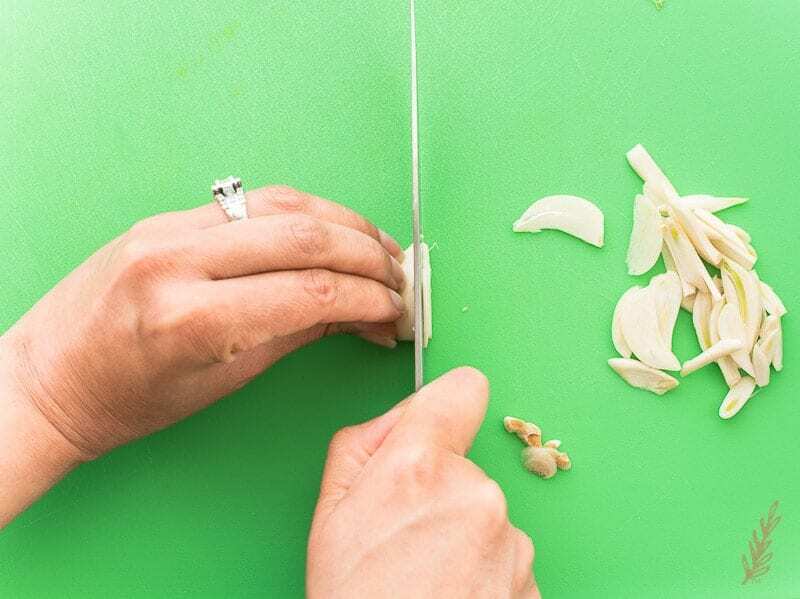 Drain the garlic on a dish that’s been lined with paper towels. This is one of the reasons why drying your sprouts is so important. A drop of water can cause chaos (even a disaster) when introduced to frying oil. One of my brussels had some water in one of the leaves and all hell broke loose. 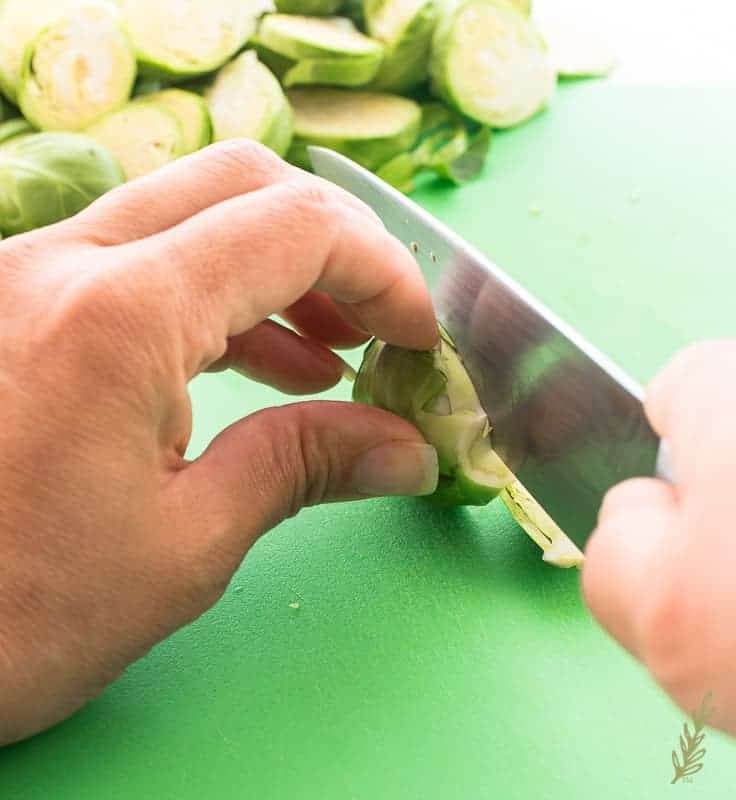 Be sure to wash and dry your Brussels sprouts before cutting and trimming them. Once they’ve been cut in half, there are so many nooks and crannies for that water to hide in, that it’s virtually impossible to dry them thoroughly if you wash them after they’ve been cut. Once your oil has reached the proper frying temperature, carefully add a handful of the Brussels to the oil. Fry each batch for 3-4 minutes. They will begin to brown and the leaves will furl and become crispy. After they’ve finished frying, use a spider to transfer them to that paper towel-lined dish to drain. Be sure to remove any loose leaves that may be floating in the oil, as well. Lightly salt the fried Brussels sprouts as they drain on the paper towels. Allow the oil to return to 350°F before adding the next batch of sprouts to the pan. Once all of the sprouts are fried and salted, toss them with the garlic chips, then transfer them to a serving bowl. The fried Brussels are best enjoyed while hot, so keep them warm in the oven until ready to enjoy. Grab the gochujang-mayo from the fridge and transfer that to a serving dish, as well. 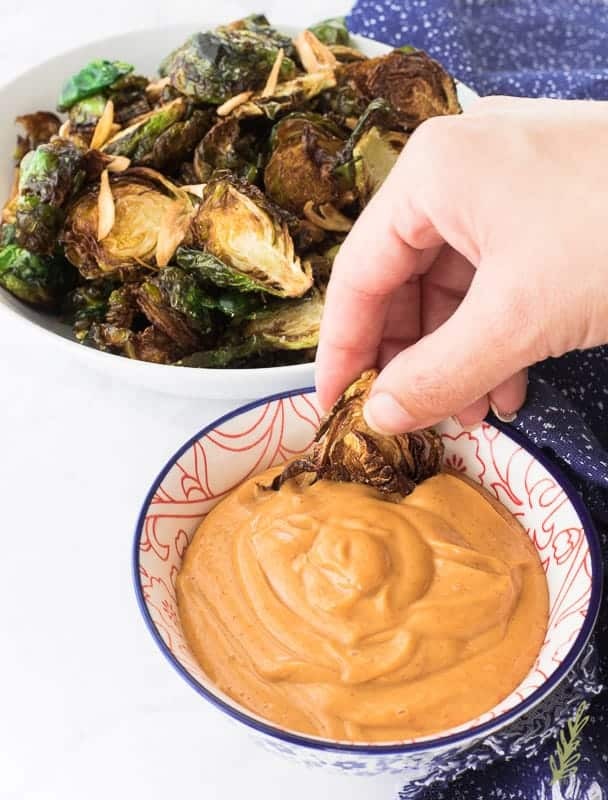 Dip the fried Brussels sprouts in the gochujang-mayo, chip-style. Or, you can toss the fried Brussels in the mayo sauce and serve them as an accompaniment. Leftovers aren’t as good as freshly fried Brussels, so enjoy them right away. Pin this, “I-need-a-week-of-rest-because-I-partied-too-hard” recipe for later, then share it with your crew. Oh, and please show the “retired” Soldier some love by leaving a congratulatory word or two for him down below! This quick starter is ready in less than 30 minutes! 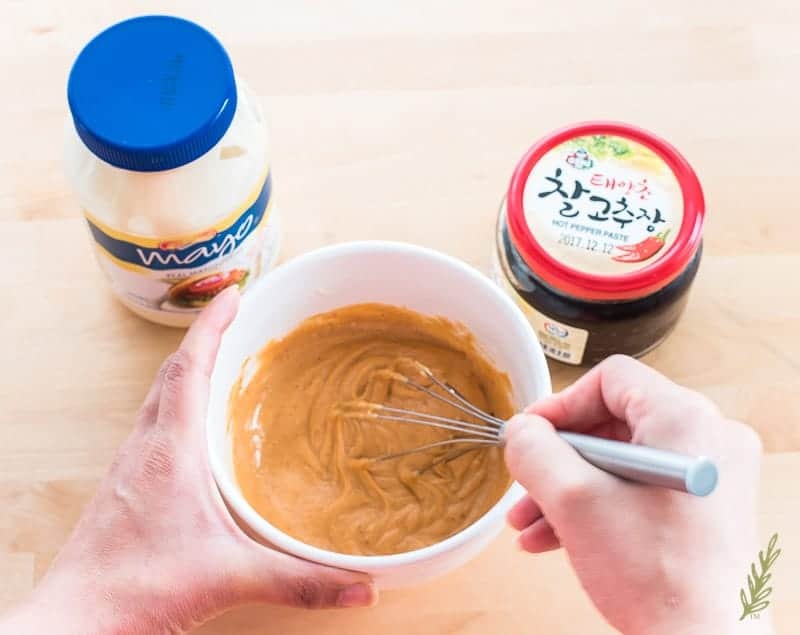 In a small mixing bowl, whisk together the mayonnaise and gochujang until smooth. Heat the oil and garlic in a large skillet over medium-high heat, or until a thermometer inserted in the oil reads 350°F. 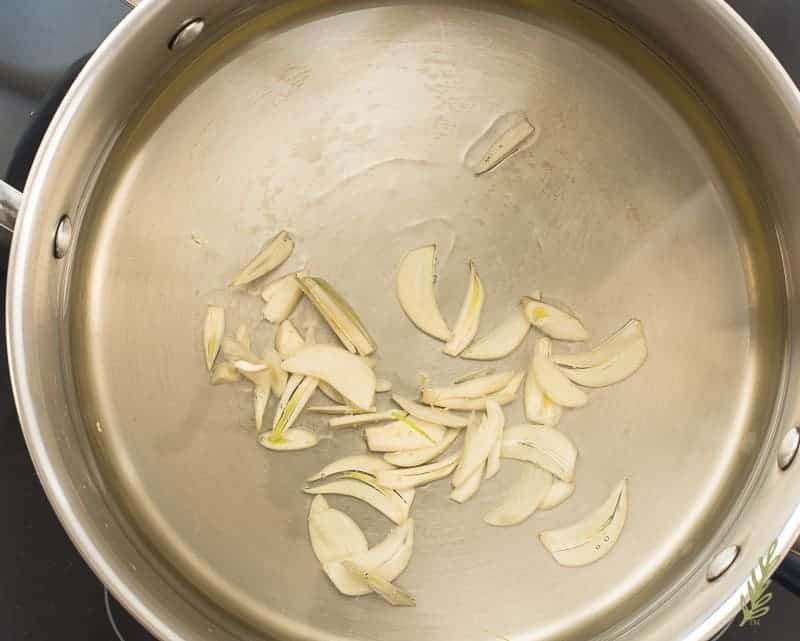 Once the garlic begins to take on a golden color, use a spider (or a slotted spoon) to remove them from the oil and drain them on a paper towel-lined dish. Set the garlic aside while you fry the sprouts. Add a handful of the brussels sprouts to the hot oil and fry for 3-4 minutes. 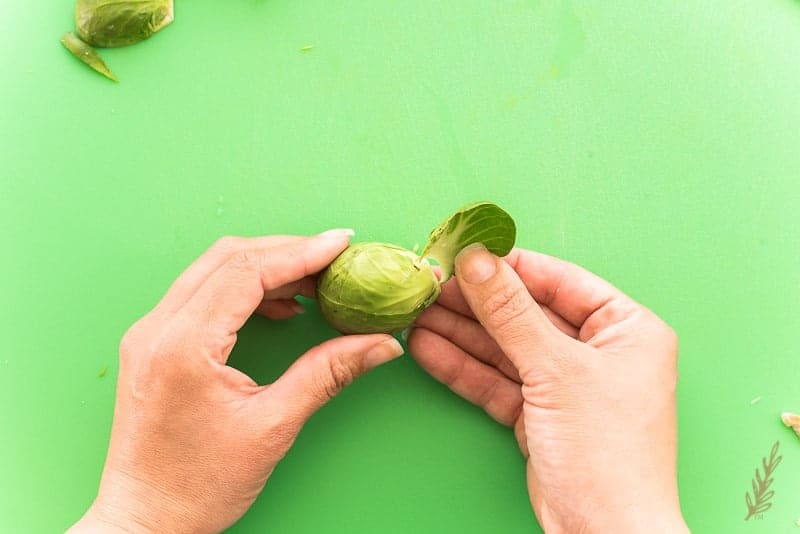 Once the sprouts begin to brown, the leaves have furled, and they become crispy, use a spider to transfer them to that paper towel-lined dish to drain. Lightly salt the fried brussels sprouts as they drain on the paper towels. Allow the oil to return to 350°F before adding the next batch of sprouts to the pan. After all of the sprouts have been fried and salted, transfer them to a serving bowl and toss them with the garlic chips. 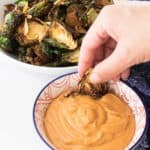 Dip the fried Brussels sprouts in the gochujang-mayo, chip-style, or toss the fried brussels in the mayo dip and serve them as an accompaniment. The fried brussels sprouts are best enjoyed while hot. Keep them warm in the oven until ready to serve. 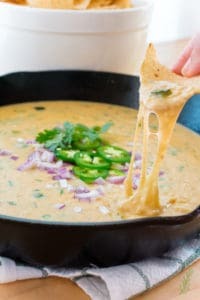 I mean… if I could, I would make this right now. I’m such a brussel sprouts lover! I do hope you get a chance to try it out, Heather! I know you’re going to love them! I have never heard of that dip. 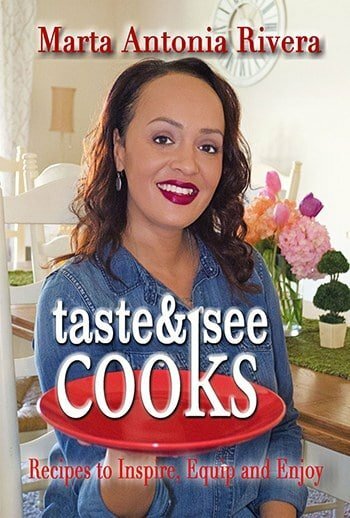 What a cool recipe. Thanks for the story and congrats! Such a great recipe, perfect for a party, the photobooth idea is so good! Thank you! We had loads of fun with the Photo Booth! What a beautiful cake and event!! Wow!! and those brussels sprouts look amazing, I’ve gotta try this recipe! Please do, Heather! I know you’ll love them. I can’t stand brussels lol but my husband would LOVE this! This reminds me of something Antoni did on Queer Eye and I’ve been wanting to try it!!! Who on what?! LOL!! Can you tell I don’t have cable? You should definitely give it a go, Brittany!